The upside down astronaut was the first U.S. astronaut to observe his birthday in space forty years ago today. During that mission he was part of an astronaut mutiny. Also, nice beards. William Pogue made his only spaceflight as pilot of the Skylab 4 mission. 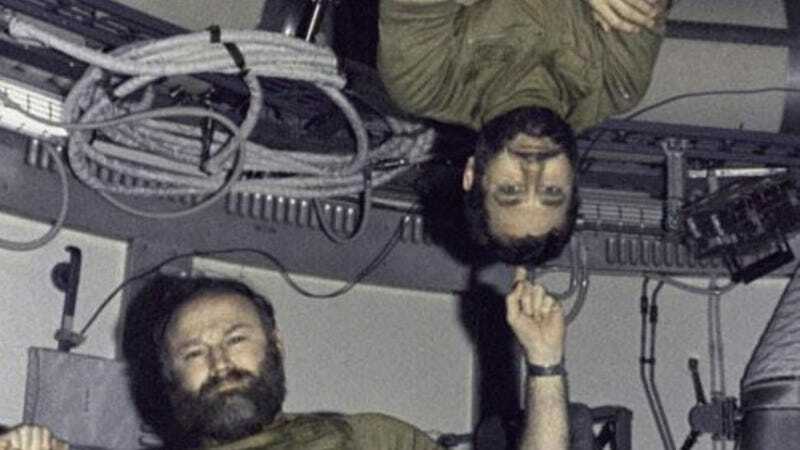 The all rookie crew (commanded by Gerald Carr, pictured here "balancing" Pogue on his finger) was the last one to visit the Skylab space station. The mission was notable not only for tasks accomplished but also what could be called the crew's mutiny during the mission. The crew felt they were being overworked and took an unscheduled day off, including shutting off the radio. The crew and Mission Control reached a compromise that modified the work schedule. As a result the crew ended up completing even more work than had been planned before launch. NASA applied the lessons learned to later scheduling of spaceflight activities. But none of the three astronauts of Skylab 4 ever flew in space again.